Whether you’re new to home buying, or you’re experienced in the industry, mistakes will always be made. However, if you’re buying your first home, you’re going to need some tips to get started down the right path. There are a lot of things to take into consideration when you’re looking for a new home. You want it to be big enough to accommodate your family and their needs, but not so big that you’re left wondering if you could have saved a lot of money. 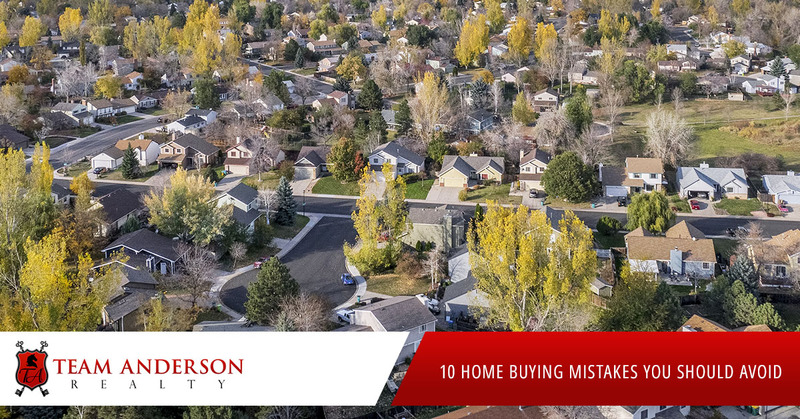 In this blog, we’re going to talk about five home buying mistakes that you should avoid. One of the first things you should do when looking for a new home is to check your credit score. You may have already looked at hundreds of listings, compared square footage, and are ready to start doing walkthroughs. However, without understanding your credit score, you will most likely be wasting your time. When it comes to home buying, getting pre-approved for a mortgage is essential, and if you have a low credit score, it may prove difficult to do so. That brings us to the next mistake, not getting pre-approved. Once you’ve looked at your credit report and understand it, you need to start speaking with lenders in order to determine which homes you’ll be able to buy. This is especially important if you’re a first-time home buyer. You’ll usually need to provide them with copies of your W-2s, bank statements, and pay stubs that will be used in combination for them to better understand your financial situation. Whether we want to admit it or not, home buying is a two-way street—well, more of a three-way street; just because you may feel financially ready to buy a home doesn’t mean a lender or seller will agree with you. As a buyer, it’s your job to convince them that you are ready. Buying a home is something that will affect you for the rest of your life. It’s not only a financial commitment, but it takes a lot of energy and passion to pursue a home that you love, so you’re going to want to enjoy it once you’ve finally acquired it. Although some people may want to sell their home after several years of living there, most will want to stay in their home for the foreseeable future. When this is the case, you’ll need a long-term budget to match it. Before you even search listings in your area, you should start planning a budget. Take into consideration your down payment, mortgage payments, closure costs, insurance, etc. The sooner you start thinking about these costs, the more financially secure you’ll be once the time comes to pay them and there won’t be any surprises. If there is one thing you can be sure of in the home buying industry, it’s that having a professional real estate agent at your side is one of the most important things you can do for yourself. Sure, it’s possible to navigate everything on your own, but is it worth the stress? Also, will you be confident that you’re getting the best deal on your new home? The great thing about having a professional realtor at your side is that there’s no need to do any research into the housing market. Realtors are always up to date on the industry, all you have to do is ask the important questions, and they’ll have the answers. A housing specialist will sift through listings, make walkthrough appointments, negotiate with sellers, and generally, look out for your best interest in a complex and constantly-changing market. If you need a real estate agent in Holly Springs, North Carolina, don’t hesitate to call Team Anderson Realty. We are your premier realty specialists in the area and are always here to help. Now that I’ve stressed the importance of hiring a professional real estate agent, It would be wrong not to remind you that not all real estate agents are created equal. Although most agents claim to be successful in their area, do they have the experience to show it? First-time home buyers especially should be aware that it’s not all “sunshine and roses” in this business. Good people do get taken advantage of, so it’s in your best interest to do your research in order to know which real estate agent you can trust. Once you have hired a real estate agent, don’t be afraid to ask questions! They’re there to answer your questions and help you feel more secure about your decisions, and if you ever end up buying or selling a home again, you’ll be that much more confident in your abilities. Are you looking for a professional and experienced real estate agent in Holly Springs, North Carolina, or anywhere in the Triangle area? If so, you should contact Erica Anderson at Team Anderson Realty today! Erica is a third generation real estate agent and has helped countless people find the home of their dreams throughout North Carolina. She’s known for her client-first approach and extensive experience with housing in the area. Visit our site to learn more about our award-winning realtors or contact us today if you’re ready to get started buying a home in Holly Springs.